MOV is a very well-known video format developed by Apple but this is not common format so it can’t be used to play videos on all devices. If we talk about MPEG 4 then it is really very nice video format supported by mostly all types of operating systems. So instead of having the video files in MOV format it will be better that you have them in the MPEG 4 format because you can watch this format on any device.  So if you have to your files in the MOV format want to enjoy them on any device with no hassle, then you can convert MOV to MPEG-4 files for the task. In this article, we’ll learn about how to convert MOV to MPEG-4 format in this article today. As we all know that there are many online video converter websites available on the Internet, but KeepVid Online Video Converter is regarded as the best when it comes to converting MOV to MPEG-4 format. This website works just like other online converter so you don’t have to install any third-party software to use this online video converter. You can quickly convert the videos to more than 50 formats with this website without any loss in the original quality of your video. Don't worry about converting MPEG-4 to MOV anymore. You can also get the work done with the help of KeepVid video converters, and you'll find the work very esay to be done. KeepVid Video Converter is also a best converter to convert MOV to MPEG-4 format, and it’s available for Windows and Mac computers. Besides the converting feature, this video converter has more premium features such as downloading videos, adding subtitles, trimming videos, etc. With the help of this software, you are able to convert videos without any issue, and you’re able to enjoy the converted video on any device you like. Moreover, this program allows you to convert multiple videos in batch, so you don’t have to convert videos one by one. 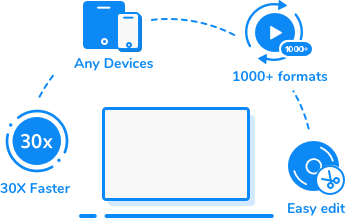 This desktop video converter enables you to convert videos to more than 1000 video and audio formats. It has a very easy-to-use interface so you can handle it within seconds. It enables you to edit videos with trimming, cropping and adding effects features. The program helps you to download videos from more than 10,000 video sharing sites. This video converter converts videos with 30x faster video converting speed. Step 1. 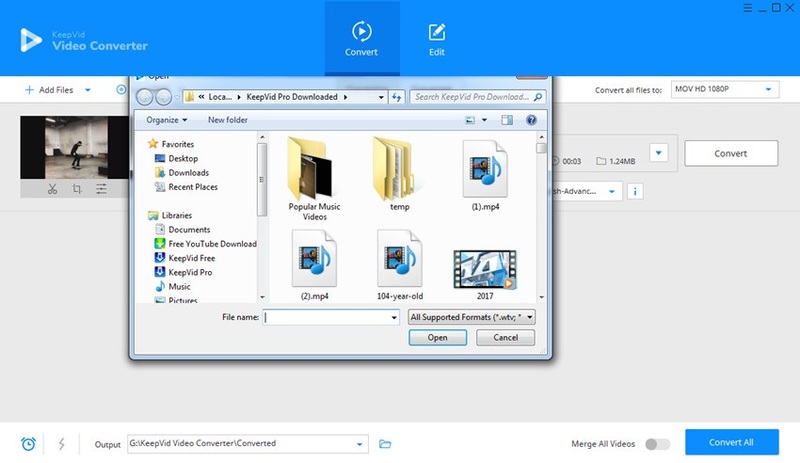 Start KeepVid Video Converter and add videos from computer. Step 2. Select MPEG-4 as an output format, and click the Convert button to start converting MOV to MPEG-4 file. Step 3. When the conversion finishes, you’ll get the converted MPEG-4 files in the Converted tab. Download and install KeepVid Video Converter on your computer, then start it. Now choose the Convert section, and click the Add File or Add Folder button at the upper left corner to add the MOV video from your computer. The program will display the detailed information of the file. Now click the inverted triangle icon at the right side of the Target area, and select MPEG-4 as output format in the pop-up dialog. Or you can click the inverted triangle icon at the right side of the Convert all files to button, and select MPEG-4 as the output format. Now click the Convert or Convert All button to start converting MP4 to MPEG-4 files. The program will show you the converting process. When the conversion finishes, you’ll get the MPEG-4 file in the Converted tab. You can also right-click the converted file and choose Open File Location to find the video in your computer. MPEG-4 is actually a video codec of MP4 format so we can say MP4 and MPEG 4 are different from each other. MPEG or MPEG-4 is video codecs are very well known compression methods of Moving Pictures Experts Group. Usually people think that MPEG-4 and MP4 are same but this is not true. MP4 is a file extension such as .mp4 whereas MPEG 4 is a video codec of this file extension.